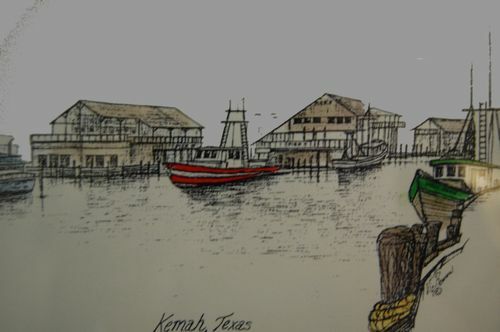 Last year we were thrilled to find this print of a watercolor in one of the art galleries that are prolific in the Kemah waterfront area. Ed immediately recognized the Davis Boatyard in the far right of the picture. Since we do not have any photos of that building in that era, this is of special interest to us. Imagine that you are standing in Clear Creek, looking toward the shore. Jimmy Walker's Edgewater Restaurant would be to your left, at the mouth of the creek. The old drawbridge would be at the far right (not in the picture). That drawbridge was replaced by the huge bridge mentioned in the Pappadeaux's caption. Larger shipyards are seen in the center of the picture. They worked on the mechanical aspects of the boats. Ed's Dad's specialty was finish work and repair of damage to the body of the boats. He was quite well-known for the superior quality of his finish work. Soon after we married, and as the result of Hurricane Carla, Ed's Dad became Harbormaster at the Houston Yacht Club, where he worked for about 30 years.